Dr. Hutch: did you beat Boris? My friend Bernard was part of the throng at RideLondon. He reports an excellent day out. He said that when he arrived home several hours afterwards, he still felt exhilarated from the closed roads, the crowd of riders, and such a convivial atmosphere. When he got there, his neighbour was in his driveway, washing the car, just like every Sunday. “Just done that RideLondon event,” Bernard remarked, in a manner designed to be both casual and imposing. Bernard contemplated for a moment his hours, his weeks, his years of dedicated training. The shaved legs, the immaculate club kit. The lean, mile-eating hunger that is part of the serious bike-rider’s aura. “Of course I effing beat Boris!” he shouted. But the day was already spoiled. Boris is probably the most famous cyclist in the UK. I’m quite serious about this. For a start, Boris has more bikes named after him than Chris Boardman. His name recognition extends across politics and current affairs in a way that even Brad Wiggins’s doesn’t. You may think he spent 100 miles on Sunday wearing a shirt that ought rightfully to have been given to a six-year-old for painting classes. But when you tell your granny you’re going cycling, that’s what she thinks you look like too. She probably thinks you wear the cycling kit to get to the event, and you change into your gardening clothes when you get there. There are some very good points about Boris as a cycling role-model. Foremost among them is that he makes cycling look like something that is unintimidating, accessible. Something that just anyone can have a go at. There are some bad points too. Foremost among them is that he makes cycling look like something that is unintimidating, accessible. Something that just anyone can have a go at. We like to think we’ve done great things for the image of our sport over the last couple of decades. When I started out, if you said you were a cyclist, people still got a sort of flat-caps ant’ terraced ‘ouses thing in their heads. And that Yellow Pages advert with the “I remember when bikes were bikes, lad. That saddle would be like sitting on a razor blade” bit. It was a struggle to get from there to where we were the week before last when, thanks to the activities of the GB track squad and Team Sky, we were glorious sportsmen and women. A veil of ignorance left us all presumed to be, to borrow Boris’s own rather nice phrase, “chiselled whippets”. And now it’s all going wrong. Too much sunlight has been allowed to shine on normality. Now, in the unfogged eyes of your neighbours, if you’re not yer actual Chris Hoy, you’re Boris. If you’re lucky. Too much more of this sort of thing, and all sorts of normal people are going to feel that cycling would be just the thing for them. Like the London Marathon, RideLondon will have an unfortunate de-mystifying effect. Before we know where we are, people will be turning up on bikes that aren’t even made of carbon-fibre, and quite possibly, wearing giraffe costumes. It could be the start of a terrible slippery slope, one that finishes with half the population using bikes to get to work, or the shops. It could even make the roads safer, the air less polluted. We need to stop Boris now, while there’s still time. I’ve had an idea for reducing doping in sport. When Stuart O’Grady admitted to doping, my wife said, ‘that’s not fair – he’s retired, so he doesn’t have to sit on the naughty step’. Only a figure of speech, but it set me thinking. 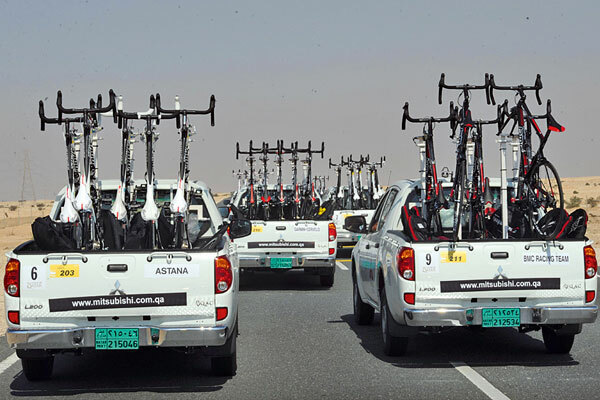 Why not have a truck in the Tour caravan with some steps on it, and force riders serving dope bans to sit on them and be driven past all the fans whose sport they’re wrecking. Perhaps they could be dressed as giant syringes. Adrian, I suspect that sort of public humiliation would be contrary to the European Convention on Human Rights. And by the way, it’s a brilliant idea. Clearly, the best way to transport a bike by car is inside – with the seats folded down, or just placed across the back seat. This has the outstanding advantage that it will leave no space for members of your family, except for one passenger seat. This seat should be reserved only for those children who have had formal training in bike mechanics and are qualified in sports massage. Use the seatbelt to prevent them escaping. If you are not sufficiently master of your domestic sphere to use this method (and if not, why not? ), there are alternatives. Roof-racks are popular, and are an outstanding method of covering your beloved bike in dead flies. On the downside, many people quickly develop a paranoia that the bike has simply vanished off the rack as they drive along, so you will have to train a small, agile child to climb out of a window to check it’s still there. While pro teams use roof-racks, simply slapping your Scott on the roof won’t make your Focus look like a team car. That will only happen if you get wedged under a low bridge, whereupon you will at least bear a passing resemblance to an Orica-GreenEdge vehicle. A boot mounted-rack is probably most popular. This is a good choice if you have a highly desirable bike, because everyone who drives behind you on the motorway will be engulfed in jealousy. Unfortunately the road grime kicked up over the racks does mean that maintaining a high level of envy will require regular stops for cleaning. Unless you have any children left, in which case they can always climb out of the sunroof with a bucket and a sponge. Probably best to put them on a safety lanyard.